The initial case type was adopted by the Scandinavian countries in 1889 and used in Denmark until the 1950's. This is a Danish tracer round, M 08/40. The identification is the white painted head and red tip (which has rubbed off). The projectile weighs 12.5 g.
Note the use of a copper cup to hold the trace material and a brass washer to close it. 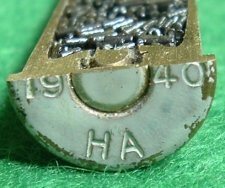 The headstamp of this round is 19 V.I. 39 40 HA, and this shows the white painted head used as an identification feature.